Huawei had introduced a brand new expandable storage called Nano Memory (NM) card when it unveiled the Mate 20 series of phones back in October 2018. Global pricing and availability details of the card are still a bit sketchy but we now have one of the first benchmarks of a 128GB NM card, which reportedly shows performance similar to that of microSD cards. One of the big highlights of the NM format is that it's 45 percent smaller than microSD cards and designed to fit in a Nano-SIM slot of a smartphone. 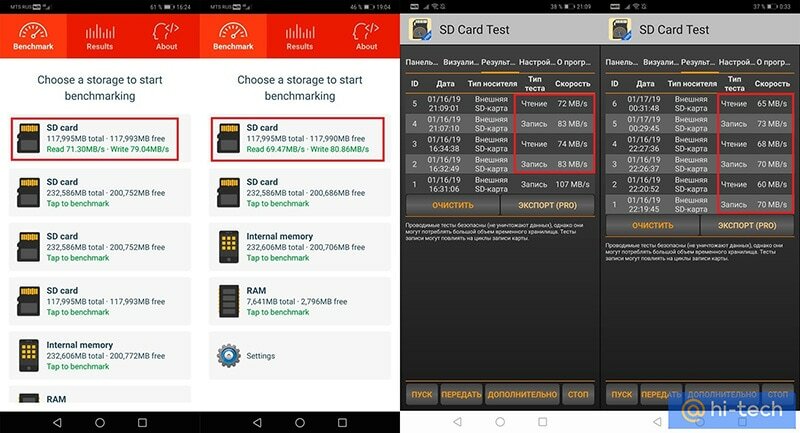 Huawei's NM cards use the eMMC 4.5 storage protocol and have a speed rating of UHS-I (U3), which promises a peak read speed of 90MB/s and a minimum write speed of 30MB/s, reports Russian technology website Hi-Tech. The website tested the 128GB NM card, which is currently the only one on sale for 5,990 Rubles (roughly Rs. 6,425). In the A1 SD Bench synthetic test, the card delivered an average read speed of 70MB/s and an average write speed of 73MB/s. In a real-world test, which involved copying a 6.7GB HD movie clip from the phone's internal storage onto the NM card, it took about one minute and 33 seconds to complete, which translates to about 72MB/s. Currently, there are just two smartphones in the world that support NM cards, which are the Huawei Mate 20 and Huawei Mate 20 Pro (Review). However, considering NM cards can fit into the same slot of a Nano-SIM, Huawei could widen the compatibility of its existing phones to support NM with future firmware updates. In order for this standard to really take off though, other phone manufacturers need to jump on board too, which is the only way we can expect to see lower prices going ahead. At the moment, only the 128GB version is on sale in Russia but Huawei did announce that NM card capacities will go as high as 256GB so we'll likely see bigger and smaller capacities down the line.